George was always full of surprises and this surprise came straight out of left field. In 1956 my husband Joe, who took great pride in being a navy pilot during the Korean Conflict, had completed his tour of duty and, without hesitation, he brought are growing family back to Ohio. Shortly after Joe, Joseph Jr. and I arrived in the Buckeye state we purchased a small bungalow and setup housekeeping in, where else but, Bay Village. Our starter home was a sweet little house, although, my father referred to it as the cracker box. In spite of that harsh criticism Joe and I spent long hours painting and cleaning the inside and outside of our charming bungalow. We planted deep forest green bushes along the sides of the house and to set off this typical postcard scene we put a large ceramic pot, filled with brilliant red geraniums, slightly left of the front door. I think it’s best not to say where we displayed the pink flamingos but those shocking pink birds certainly lit up our neighborhood. Now about George. Occasionally we would bump into each other at the Bay Village shopping center or sometimes I’d catch a glimpse of his powder blue convertible driving by our house. But, for the most part, we saw very little of each other over the preceding years. Once I caught my breath, a million questions began to march through my brain. Why now? Doesn’t he understand our lives are going in different directions? What would Joe think? What would George’s wife think? Would are kids get along, and more importantly, where would we get the money? On the other hand, perhaps George’s call could have been a friendly gesture between two old pals. But, for whatever the reason, by the end of our conversation I was exhausted. Later that night when I was alone in the living room the unexpected happened. I had a vision and, to this day, I can’t remember anything tickling my funny bone the way that vision did. There we were, the Schriner family, living in the house next to the Steinbrenners. 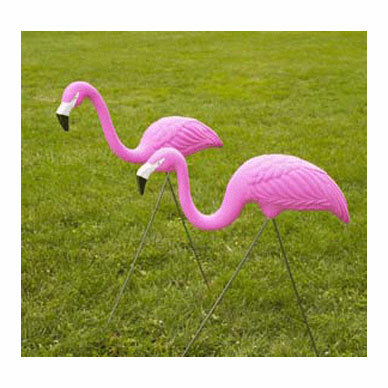 And, in the center of our front yard, lighting up George’s glamorous neighborhood, spotlight and all were those shocking pink flamingos. What could be funnier than that? Oh, in case you want to know, I neglected to tell Joe that George called today.